Mayor Bill de Blasio introduced his pilot program five years ago, hoping hundreds of thousands of tons of the city's leftovers and yard waste would be churning their way through the system by now to be turned into compost, gas or electricity. But expansion has been put on hold because not enough people are pitching in to make it cost-effective. The city collected only about 13,000 tons from residents last year and found that the 3.5 million people currently in the voluntary program are only separating 10.6 percent of their potential scraps. "Honestly, I think it's a complete waste of time," says Anselmo Ariza, who maintains the trash and recycling bins for several blocks of apartment buildings in Brooklyn. "Some people use them, but most of them just put trash and plastic bags in there." Marzena Golonka complained that the city's once-a-week pickup at her apartment building in Brooklyn is not frequent enough to keep the odors and rats away. "It's vile," she says. "Until sanitation starts doing their job effectively, I'm not going to have a brown bin." De Blasio's goal of sending zero waste to landfills by 2030 depends on residents and businesses separating their organic waste, which currently makes up a third of the trash that ends up in landfills and is a major producer of greenhouse gases. But when not enough people use the service, the city's trucks devoted to such waste are not filled, increasing the costs per ton. And without a steady stream of scraps, the expensive infrastructure that needs to be built to process the waste into compost, gas, or electricity is not worth it. 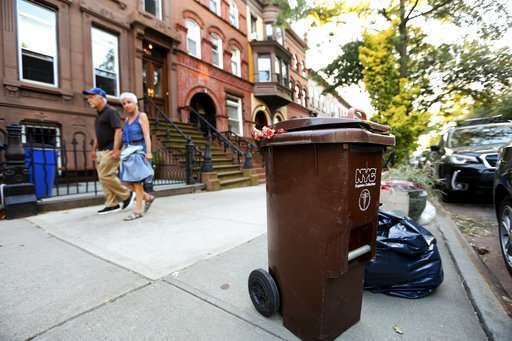 The city is still committed to expanding the program to all 8.5 million New York City residents at some point but right now is focused on making the system more efficient, Sanitation Commissioner Kathryn Garcia said last week. One budget watchdog group estimates that collecting organics costs over five times more than collecting normal garbage. Ana Champeny, the Director of City Studies at the Citizen's Budget Commission, calculated the collection cost for organics at around $1,700 a ton, compared with $291 for regular refuse. That only adds to the overall cost of a program the commission estimates at $177 million to $251 million every year. Sanitation officials are trying to get more people to use the service by going door to door and even putting thank-you notes on the brown bins they gave residents for organics. And the city is trying to address the smell issue by reminding people that the brown bins, unlike many recycling bins, can be sealed tight. "We are having to overcome the 'ick' factor," Garcia says. Despite the setbacks, de Blasio's administration still boasts that New York offers residential organic pickup to more people than anywhere else. When businesses that use mostly private haulers are factored in, the city's annual tonnage of organics last year increased to around 40,000. But both San Francisco and Seattle, which have mandatory programs backed up by fines, each collect more than four times as much, over 170,000 tons every year. 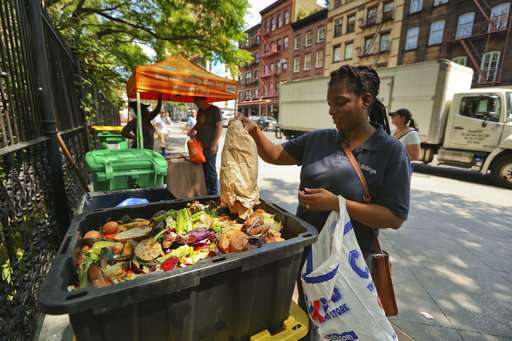 New York City is estimated to produce 1 million tons of organic waste a year. 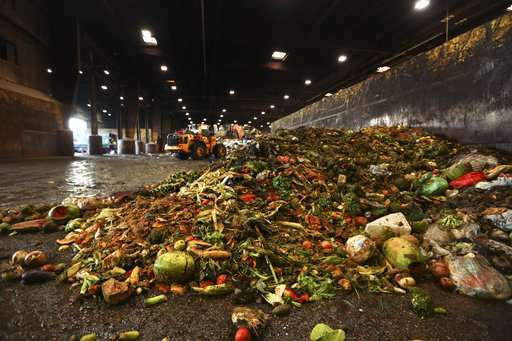 But for now, the city can't even guarantee a steady stream of leftovers for the 11 facilities it has contracted to turn up to 400,000 tons of organic waste a year into compost, gas or electricity. 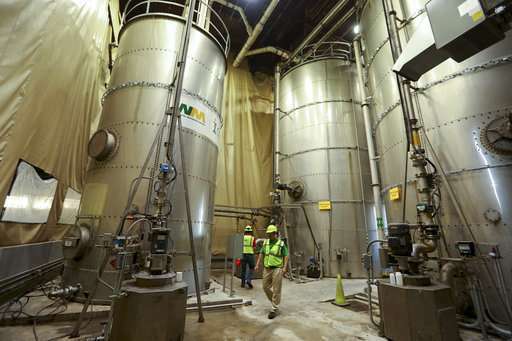 A $7.5 million machine that process organics at a Waste Management facility in northern Brooklyn, for example, runs for only a few hours a day. The machine sorts plastic bags and other trash out of the food before mixing it into a "bio-slurry" that can be converted into methane gas. Managers want to keep the machine humming around the clock at its current capacity of 250 tons a day, but the 60 to 120 tons of leftovers they are currently getting every day does not make that possible. Supervisor Peter DeLuca is hoping the city gets tougher about getting people to put their leftovers in the bins. 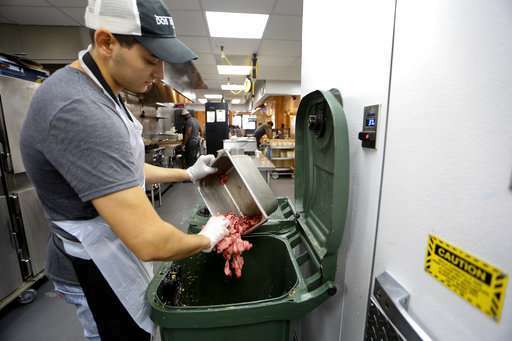 This month, the city rolled out laws that require chain restaurants, grocery stores, and larger restaurants to separate their food from other garbage, but they won't start giving fines for violations until February. "The word is getting out," De Luca says. "It's just getting out pretty slow."